From the Why Didn’t I Think of That! department, today we bring you a novel idea for a website that’s both incredibly cool and vastly useful — 3D Printing Price Check. As there are quite a few online 3D printing services available for a maker to choose from, anyone wanting to send something off to print has to ask themself the question, “Who’s got the best price?” You could upload your file to every service and compare prices, or you could calculate it’s mass and do some figuring on their price charts. But now there is an easier, much faster way. 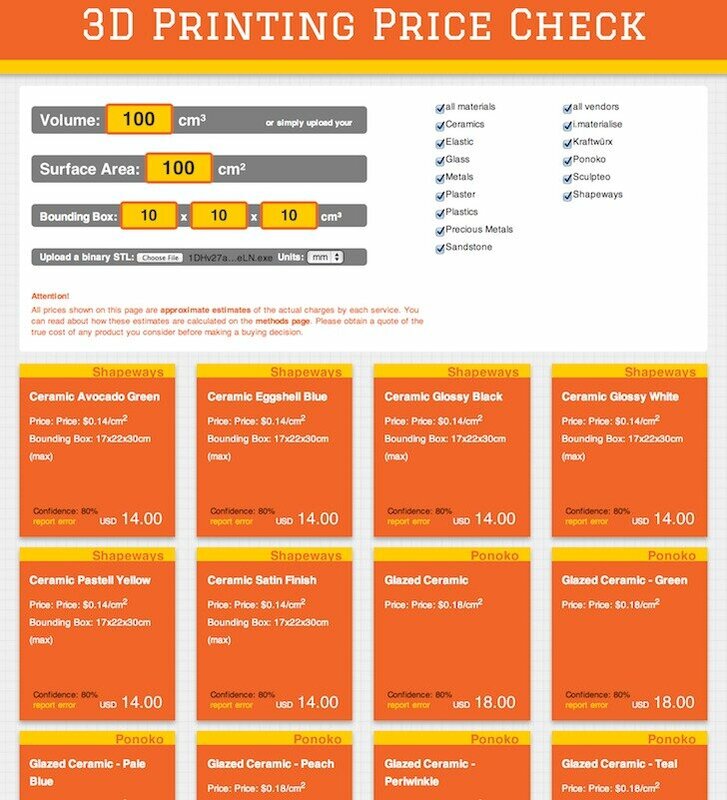 Now, at 3DprintingPriceCheck.com you get a fast (as in lighting speed fast) price check on 3D printing either by uploading your model or by specifying the volume surface area and bounding box of the model. And we’re not just talking about ABS plastic here, we’re talking about ceramics, elastic, glass, metals, plaster, plastics, precious metals and sandstone. As for the online printers, the price checking site will check i.Materialise, Kraftwurx, Ponoko, Shapeways and Sculpteo. And all others who want to participate are invited to join up. Keep in mind that while they do their best to show what the true costs will be, all calculated prices are to be used as approximate estimates of the actual charges by each service. The site is brought to you by the founders of The Society for Printable Geography, makers of 3D-printed geographical jewelry and accessories. So I was getting ready to post this and my son comes in and showed it to him. He’s not even into 3D printing. And guess what he said? “Dad, why didn’t you think of that?” Argh.